The Global Volcanism Program has no activity reports for Baluan. The Global Volcanism Program has no Weekly Reports available for Baluan. The Global Volcanism Program has no Bulletin Reports available for Baluan. The circular, 5.5-km-wide island of Baluan in the Admiralty Islands is formed by a Pleistocene stratovolcano with a large summit crater and several flank vents. Some of these might be of Holocene age (Johnson 1990, pers. comm.). In contrast to its neighboring islands to the north, Baluan has erupted basaltic rather than rhyolitic rocks. Sabroma, the elliptical summit crater, has a maximum width of about 1 km. The arcuate rim of the Batapona Mountain pyroclastic cone is prominent at the north edge of the island. Several small islands consisting of cone remnants are located within a kilometer of the north coast. Warm springs occur along the coast. The only historical activity is an uncertain report of a submarine eruption near the island in 1931. Johnson R W, Davies R A, 1972. Volcanic geology of the St. Andrew Strait Islands, Bismarck Sea, Papua New Guinea. Geol Surv Papua New Guinea, Note on Invest, 72-002: 1-29. Reynolds M A, Best J G, Johnson R W, 1980. 1953-57 eruption of Tuluman volcano: rhyolitic volcanic activity in the northern Bismarck Sea. Geol Surv Papua New Guinea Mem, 7: 1-44. There is no Deformation History data available for Baluan. There is no Emissions History data available for Baluan. 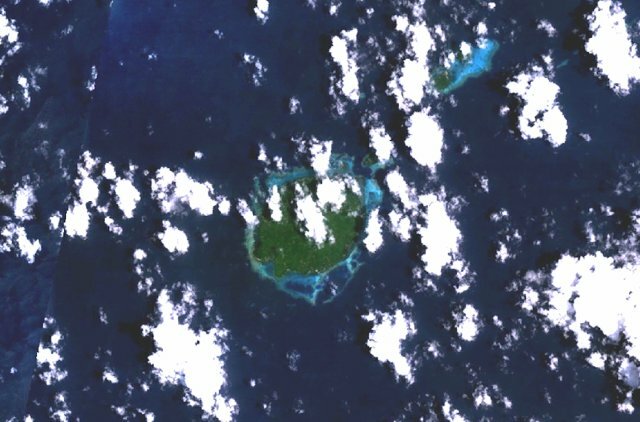 The circular, 5.5-km-wide island of Baluan (center) in the Admiralty Islands lies SE of Manus Island and across the St. Andrew Strait from Lou and Tuluman Islands (out of view to the north). This Pleistocene stratovolcano has a large summit crater and several flank vents. In contrast to its neighboring islands to the north, Baluan has erupted basaltic rather than rhyolitic rocks. The Pam Islands to the NE are visible at the upper right in this NASA Landsat image (with north to the top). There are no samples for Baluan in the Smithsonian's NMNH Department of Mineral Sciences Rock and Ore collection. Large Eruptions of Baluan Information about large Quaternary eruptions (VEI >= 4) is cataloged in the Large Magnitude Explosive Volcanic Eruptions (LaMEVE) database of the Volcano Global Risk Identification and Analysis Project (VOGRIPA).